International Journal of Research in Health Sciences,2014,2, 4,1150-1156. 1Senior Resident, 2Ex Professor & HOD, Dept of Microbiology, SV Medical College, Tirupati, Andhra Pradesh, INDIA. 3Assistant Professor, Dept of Microbiology, Osmania Medical College, Hyderabad, Telangana, INDIA. 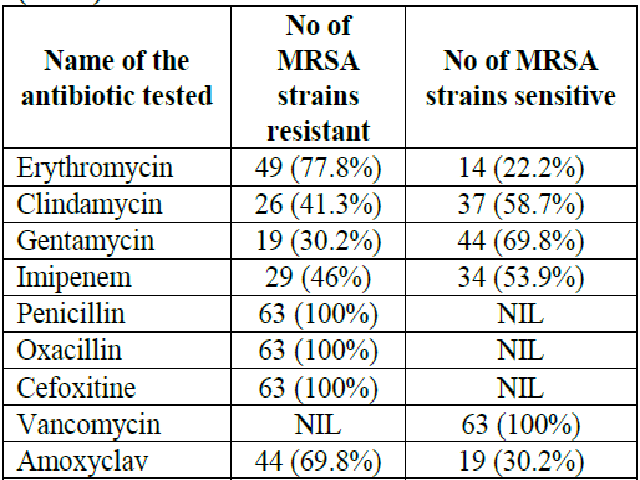 Aim: The present study was undertaken to determine the sensitivity of Staphylococcus aureus isolated from infected patients to common antibiotics and to evaluate the possible presence of VISA (vancomycin intermediate Staphylococcus aureus) and VRSA (vancomycin resistant staphylococcus aureus) in Sri Venkateswara Ramnarayan Ruia Government General Hospital (S.V.R.R.G.G.H), Tirupati. Materials and methods: A total of 120 isolates of S.aureus which were isolated from various clinical samples were tested for methicillin resistance using the oxacillin disc diffusion test(1μg) and cefoxitin disc diffusion test(30μg). All isolates were subjected to minimum inhibitory concentration(MIC) testing with agar dilution method according to the CLSI(Clinical Laboratory Standards Institutes) guidelines. Disc diffusion method was also used to determine the susceptibility of strains to common antibiotics. Results: 64(53.3%) isolates were found to be MRSA by the cefoxitin disc diffusion method and 63(52.5%) isolates were found to be MRSA by oxacillin disc diffusion method. No VISA&VRSA isolates were detected by using the MIC agar dilution method. MRSA isolates were also highly resistant to other antibiotics that were tested. Conclusion: No VISA and VRSA was isolated. High prevalence of resistance among Staphylococcus aureus to commonly used antimicrobial agents was also noted.